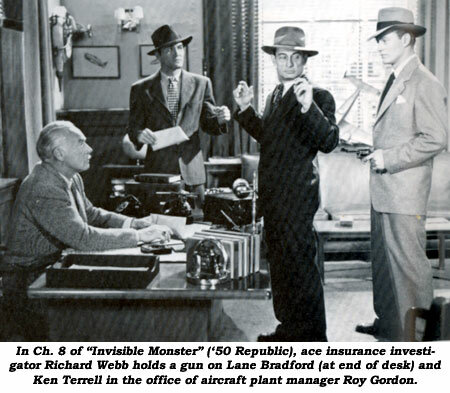 During the ‘40s and ‘50s Ken Terrell was one of Hollywood’s busiest, most respected stuntmen. Born April 29, 1907, in Coolidge, GA, at 14 he and his family moved to Atlanta. It was there Ken entered Georgia Tech with the intention to play football. He didn’t make the team because he was too small. To correct this he responded to a newspaper ad for Earle Liederman’s Physical Culture mail order program. His body responded well and he won the Earle Liederman Most Perfectly Developed Man contest for two or three years circa 1925-1927. Ken always had a flair for performing and, as his body developed, he decided on a show business career in vaudeville. His vaudeville ambitions were not fruitful so in New York Ken eked out a living as a model in a 5th Avenue department store window. Leaving New York he tried his luck in Chicago, still modeling, finally securing a booking on the Keith Vaudeville Circuit. Ken worked the next four years in various acts with numerous partners, one being the diminutive Jimmy Fawcett. As bookings became fewer and fewer, Terrell, Fawcett and Helen Thurston, Jimmy Fawcett’s wife, decided to head west to try their luck in Hollywood. They arrived in the film capitol in mid 1937, soon obtaining a role as brothers in RKO’s “Living On Love” w/James Dunn, but things at first were slow-going. Ken finally landed a job on the serial, “Daredevils of the Red Circle” (‘39). Stuntwork became more frequent as the hawk-nosed Terrell built up a good reputation as a tough, capable performer. 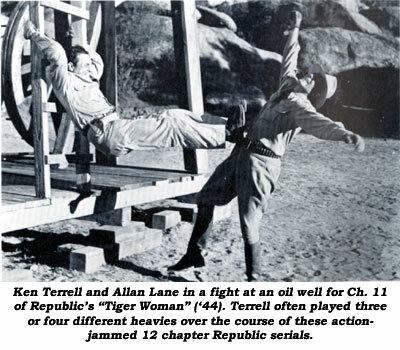 Helen Thurston became one of the groundbreaking stuntwomen, working at Republic with Terrell and Fawcett. Sadly, in 1942, Ken’s old vaudeville partner, Jimmy Fawcett, was killed in a car/motorcycle accident. 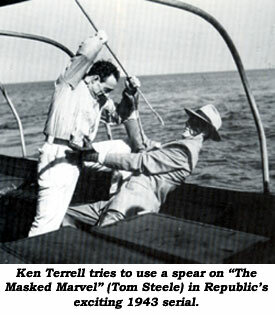 At Republic, Ken was now one of the mainstays of the studio’s action daredevils. 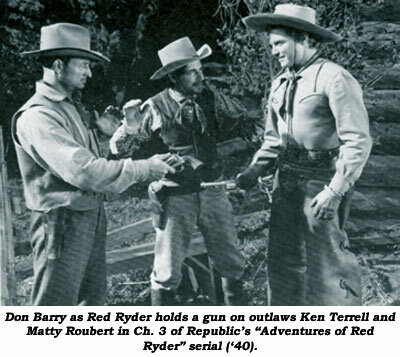 From ‘39 to ‘54 Kenny appeared in over 42 serials and 30 westerns at Republic. Over 61 serials at all studios. According to Ken’s own personal files, he appeared in and completed 1,354 stunts, including fights, knife and sword fights, Ju Jitsu, car chases, skids, crashes, leaps and transfers to and from cars and trucks, high dives, long swims, high falls, bulldogs and anything else the script called for. After successfully completing all the above action requirements, Ken broke his foot during the filming of a Chevrolet commercial in 1958. He was able to complete the commercial because he requested the end of the storyline be shot first. We wasn't feeling too steady that day and he had to jump off a 20 foot roof before completing the showing of the features of the new car. Fortunately, the director went along with his suggestion. It was a bad break and he never fully recovered to sufficiently enable him to return to full time stunt work. In 1959, Ken started rehearsals for the Kirk Douglas epic, “Spartacus”, but once again the lingering effects of his leg injury forced him to withdraw from the production. Ken went in another direction for the next few years, trying his hand at straight acting roles with no strong physical action involved. 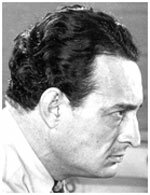 From ‘61 to ‘64 Ken obtained some acting work (“Master of the World” w/Vincent Price, “Wagon Train: Don Alvarado Story”, etc.) but it was just not enough.